For more than two decades, men and women from throughout Southern California would visit a faith healer at this 40-acre site in hopes of finding a cure to their ailments. She was known to many as Mother Caroline. Caroline Beran Hoertig, who described herself as a divine healer, distributed promotional cards, which declared, “I have been doing this work for many years as God’s servant healing hundreds of cases that appeared hopeless”. She claimed to have been responsible for miraculous recoveries. The cards featured her in a flowing white gown. 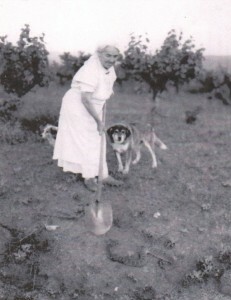 Mrs. Hoertig, her husband Richard and their four children moved from the Los Angeles area to Valley Center in 1924 and purchased a 40-acre parcel. They planted 10 acres of almonds and 15 acres of grapes. The grape harvest was productive. During Prohibition in the 1930’s, 50-gallon barrels of wine filled a basement that had been dug beneath the house. In the late 1930’s, steel gates and a sign were placed on the property reading Happyland Sanatorium, and Caroline’s faith healing career began. Guests stayed in cabins that had been built on site. She continued to receive visitors until she died in 1960 at age 81. Caroline had bequeathed the property and its many buildings to the Lutheran Laymen’s League, an affiliate of the Lutheran Church. To honor Mrs. Hoertig, the League renamed the site Camp Caroline and placed a marker on the chapel, which had been erected on the property. For the next 49 years, the League operated a church camp. (From 1978 until 1992, the Light of the Valley Lutheran Church held its services here in the chapel). In 2009, the property, now at 34 acres and with cabin accommodations for 78 guests, was sold to Kenneth Voertman, Sr. Renamed Broken Rock Ranch, it continues to function as a camp site. It is operated by Kami and Kenneth (Will) Voertman, Jr.